I gave a workshop a number of years ago with Hard Shell Word Factory author Liz Hunter for the Wisconsin Romance Writers’ of America. We’d wanted to do something fun and inspirational about how attitudes (yours and others’) change after you get your first contract. The committee wanted something on contract negotiating. We figured we could be fun, inspirational, and talk about contract negotiating. But, at the time, Liz and I were both electronically published with author friendly contracts that neither of us negotiated. What did we know about contract negotiating? Also, being newly published and being published only electronically, we worried about what kind of draw we’d have. We were scheduled against two print-published authors, one of whom was far better known than the two of us. Who was going to want to hear what little ol’ us had to say? The evening before the workshop, I optimistically told Liz that I knew we’d have at least four attendees to our workshop…my four critique partners. We gave each other weak smiles, reassured each other we’d prepared best we could, and headed for the bar. How were we going to pull off a workshop on attitude when we lacked confident attitude ourselves? Somewhere that year of my first contract, I’d gained an alter ego. I’m not exactly sure when Her Royal Highness first graced us with her presence. She probably gave us a queenly wave during an all-night brain storming session. Those of us estrogen driven writers have been there, high on chocolate and punchy for lack of sleep. Anything is funny at that point. But this affectation wouldn’t die. 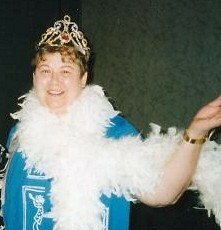 Encouraged by her groveling subjects, The Queen made her first public appearance at the WisRWA conference in Oconomowoc, Wisconsin in 2000 complete with rhinestone crown and feather boa. The minute people walked into our workshop, they began to smile. Now I’d rather face a smiling crowd any day than a somber-faced bunch expecting sage advice from me. In case you’re wondering, no, I was not the class clown. In fact, I was the kid trying to fade into the background in my school days. But dress me up in something ridiculous or give me a prop and I acquire attitude. Maybe Liz and I could pull off this workshop after all. Fame, Fortune and Reality. That’s what we’d promised to talk to the conference attendees about and here I was flicking my boa and straightening my crown. Reality? Liz had the audacity to inform our audience that I was not reality. Excuse me, but I assure you The Queen is quite real. Liz showed graphics of how being published might make one expect to go from a hovel to a mansion…or in The Queen’s case a castle, from rusted out car to limo, even from fat to thin. There was The New York Times Best Seller List for inspiration and, to demonstrate the possibility of unexpected complications, the Salman Rushdie headline proclaiming him a man with a price on his head for merely writing a book. But nothing was more graphic than The Queen. Do I hear murmurings about ego among the peasants? Heads have rolled for less, you know. We spoke about using a humorous attitude to keep those cherished writing friendships that can be tested when one member of the group publishes and the rest are left yet aspiring. Example: It was the not-yet-published friends that created The Queen. We advised that egos be kept in check lest we offend friends, family, and most importantly prospective buyers and fans. Example: The Queen. Just try throwing a royal tantrum when you’re laughing at yourself. It can’t be done. We offered suggestions on how to keep busy during that long wait between contract signing and publication, on how to maintain a productive attitude. The Queen even confessed she was BAD ATTITUDE. 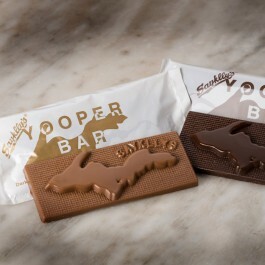 With our audience now high on the endorphins of laughter and the chocolate I’d handed out (A tip to anyone who ever has to speak to a group of women: BRING CHOCOLATE. ), I got down to business. They wanted to know how attitude got me my first contract. I brought up those Oprah type shows about visualizing what you want and pointed out how the line in Field of Dreams, “Build it and they will come,” exemplifies this. I informed them that I wrote and I had no doubts it would sell. For eight years, I had no doubts. Then I joined a professional writers’ group, started learning everything I didn’t know, started to doubt if I’d ever get published, and ended up published. It seems I’m not exactly the post child for positive visualization. 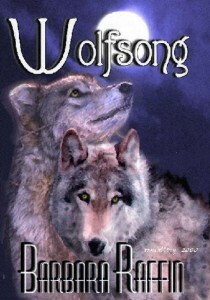 But I do know that my attitude had changed just before I sold my first book, Wolfsong. I’d done the workshops, read the self-help books, taken classes, and had an agent who believed in me. There had even been an editor or two who’d praised my work, hung onto it “in case they had a slot to fill,” and on occasion asked for revisions, yet I still didn’t have a contract. It seemed I had done the work and had the talent. It was just a matter of waiting for the break, the luck factor. Now sometimes you need to find a reason to give yourself attitude. January 2000 I found my reason. I won an Oreo yoyo. Now that doesn’t seem like much. But, when I opened that specially marked package of Oreos and found one of my cookies said I’d won a yoyo, I knew my luck had changed. Never mind that everybody who bought a specially marked package of Oreos probably won at least a yoyo. I had won a yoyo. Granted, I was supposed to send this specially marked cookie to Nabisco to get my yoyo. But I didn’t need a yoyo. I needed the luck. So I kept the cookie. I showed my audience the cookie as I told them I had let the cookie change my attitude. I was a winner. I was going get my foot in the door with the electronic publishers. I was going to sell my book. 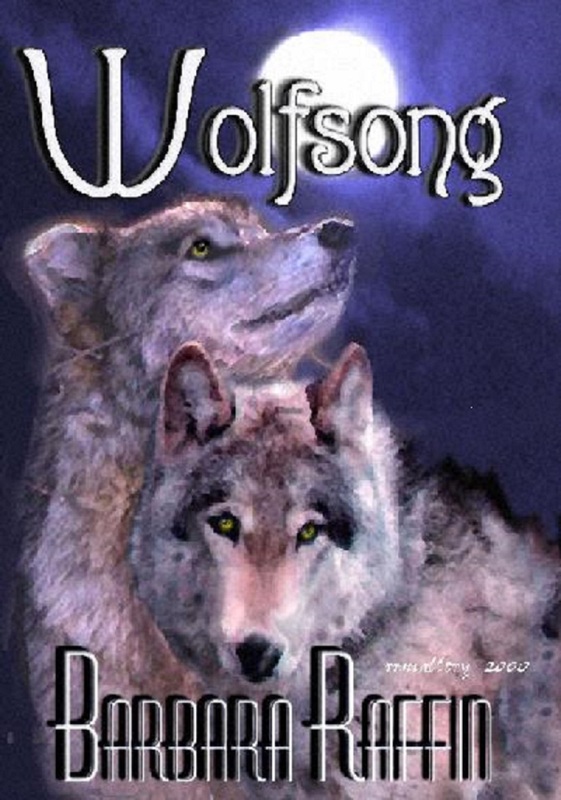 I picked 3 electronic publishers, sent them Wolfsong, and wound up with three contract offers. Sometimes you have to find a reason to give yourself attitude, because, sometimes it takes attitude to turn your dream into reality. Liz’s and my dream for the weekend was to have a successful workshop. To our relief, we had a fair turnout. To our amazement, keynote speaker Debbie Macomber chose to attend our workshop. To our great pleasure, the multi electronically and print published Jane Toombs called our workshop excellent. No one could have anticipated we were going to entertain them with garish props and silly slides; and I didn’t notice anyone running up and down the halls shouting, “Come here. You gotta see this.” No one could have known our survey of published writers had netted some unique contract negotiating tips. So, how did we manage to draw more than our friends to our workshop? Maybe it was the catchy workshop title: Fame, Fortune and Reality. Maybe it was a good workshop description: An irreverent look at the changes an author can expect once a contract is in hand. Or maybe it was attitude. We planned it and they came. This entry was posted in Writing Tips and tagged epublishing, maintaining optimistic attitude while waiting to publish, surviving being published, workshop, writing attitude on September 19, 2013 by Barbara Raffin.